The Wait Is Over! A 2 Bedroom Split-Plan Suite At King George Square Has Finally Entered The Market! 1,140 Sq Ft Of Well Finished / Designed Open Concept Space. Great Master Bedroom With And Ensuite Bathroom And Huge Terrace! Highly Coveted Location … Great Shops And Restaurants At Your Doorstep. 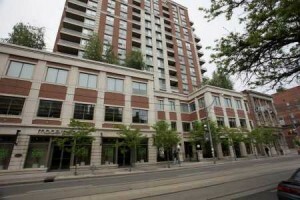 Very Easy Access To The Financial District And St. Lawrence Market. Nothing To Do But Move In And Start Enjoying This Fantastic Urban Space. Welcome Home!! 2 Terraces: One Off The Living Room And One Off The Master Bedroom. Incl: Fridge, Stove, Dishwasher, Washer, Dryer, Microwave, All Electric Light Fixtures, All Window Coverings. 2 bedrooms, 2 bathrooms, with 1 parking space and a locker.